UPDATED: Just as three Norwegian and British men went on trial Tuesday, accused of hate crimes against two Muslim men in Oslo, Norwegian government minister Solveig Horne was being grilled by a UN committee in Geneva over the country’s failure to better combat such crimes and racism. The trial itself is a result of Norway’s efforts to take hate crimes and discrimination more seriously, but UN officials aren’t satisfied. The trial had to be moved to a larger courtroom because of a lack of space in the city court, reported Norwegian Broadcasting (NRK). The case has attracted media attention, after the three white defendants allegedly launched an unprovoked attack on two men from the Middle East late one night last winter. The three men denied they are neo-Nazis, even though police found Nazi greetings and swastikas on the mobile phone of one of them. The three white men continued to verbally attack the two Kurdish men as well, repeatedly using vulgarities and screaming that that the “(epithet deleted) Muslims” didn’t “have anything to do here (in Norway)” and labelling them as “terrorists,” clearly choosing to overlook the facts that one of the three attackers was himself a foreign citizen in Norway and that the terrorist attack against Norway four years ago was carried out by an ultra-right-wing white Norwegian man, not by Muslims. The 33-year-old is also charged, meanwhile, with beating a woman who earlier was a leader of the white supremacist Norwegian Defence League but since has cut ties to the organization, and he was convicted of unprovoked violence in 2003. Both he and the 28-year-old said all the Nazi greetings and photos of people posing with flags bearing swastikas and other white supremacist symbols found by police were merely a result of “internal humour” and not intended to signify ties with neo-Nazis. NRK reported their 52-year-old British co-defendant did not appear in court. Police also understand that, and say they’re trying to crack down on hate crime. 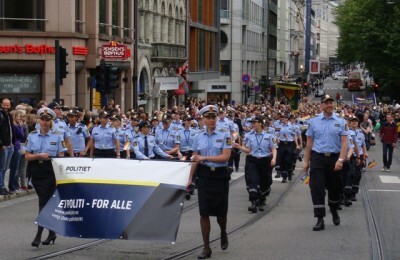 Last fall, the Oslo Police District formed the country’s first hate-crime group specifically charged with handling complaints and addressing cases that initially weren’t registered as hate crimes. Aftenposten reported that as of July 27, Oslo police had registered 69 cases so far this year, as many as in all of 2014. The newspaper has also reported on how hateful comments, mostly against Muslims, also swirl around the Internet, and that both verbal and written attacks against Muslims are more common than racially motivated violence. Aftenposten itself is logging hateful comments and threats that come in to its own online channels. The most alarming are reported to the police. The government minister questioned by a UN panel in Geneva on Tuesday had to answer for how Norway is tackling hate crimes and other forms of discrimination. Norway is usually viewed as a star in the UN system, but in this case, UN officials are not satisfied with how Norwegian authorities are fighting racism. Norwegian authorities have been criticized in the past by the UN, the Organization for Security and Co-operation in Europe (OSCE) and the Council of Europe, also during the former Labour-led government, for not better addressing hatred. Now it’s Solveig Horne’s job to respond to criticism from 2011, when the Norwegian government was charged with not compiling statistics over hate crime, not defining the issue and failing to address how expressions of racism are damaging. Horne claimed she found the UN committee’s questioning to be “constructive” and thought she and her Norwegian colleagues “answered well and comprehensively.” The head of Oslo’s anti-racism center was less positive, suggesting Horne did not answer in detail. In the ministry’s version of events, however, Horne highlighted the Oslo police’s new group that’s handling hate crimes and stressed the government’s efforts against radicalization and violent extremism and in favour of integration. 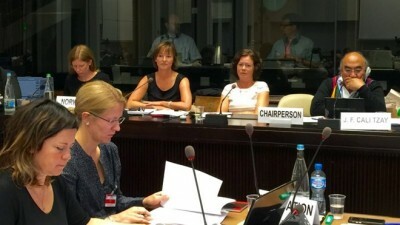 “During the hearing in Geneva, Norway was praised for the work being done, but the UN committee also addressed the challenges we have in Norway today,” Horne stated. “Norway is delivering well on many points in the UN’s convention against racial discrimination, but there are still areas where we can be better.” The UN later concluded that Norwegian officials, Horne included, need to acknowledge that racism exists in Norway, that it needs to be called for what it is (not simply “discrimination”) and that Norway needs the UN’s help to combat it. Horne insisted that the government’s own work in fighting racism had high priority. Her party, meanwhile, has been under pressure just recently after local Progress Party politician Roald Bentzen wrote on the Facebook page of the party’s senior citizens’ group in Vestfold that the deputy leader of the Labour Party and former government minister Hadia Tajik “has a mission from Allah to ‘Muslimize’ Norway,” and that “all (Muslims) who come (to Norway) have the same assignment, young and old, with and without weapons.” That set off protests and the party distanced itself from Bentzen’s remarks. Local newspaper Gjengangeren could later report, however, that the party’s candidate for mayor of Horten in Vestfold, Freddy Martinsen, merely asked Bentzen to make such comments anonymously instead of identifying himself as a Progress Party politician.